Welcome to the subscription order entry page for Holiness Today, the denominational magazine for the Church of the Nazarene. The magazine serves English-speaking Nazarenes around the world and all Christians seeking holiness material. 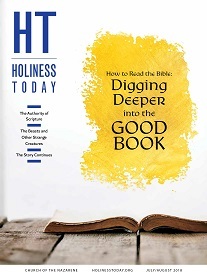 Holiness Today is published 6 times a year. Enter your name, address, phone, fax, and email. (Optional) Make an additional donation to Holiness Today. Credit card payments only for digital subscriptions. Your digital subscription will be auto renewed on its anniversary date. A reminder email will be sent at renewal time. I would like to support the publishing mission of Holiness Today by making an additional donation today. Yes, I would like to receive the FREE newsletter. Holiness Today is committed to protecting your right to privacy. We will collect, store and process your personal data for the purpose of servicing your subscription. By using our website and services you consent to our collection and use of your information. Holiness Today would like to send you email newsletters and other communications about events and special offers, and occasionally, information from carefully screened partners that could be of interest to you.